Ok so I’ve finished up the conversions on Belial and I am now making some decisions on painting him. I’ve been debating on how I should paint his robes. Since I have modeled him in a pre-heresy style armour I’m wondering how should I go about his robes. 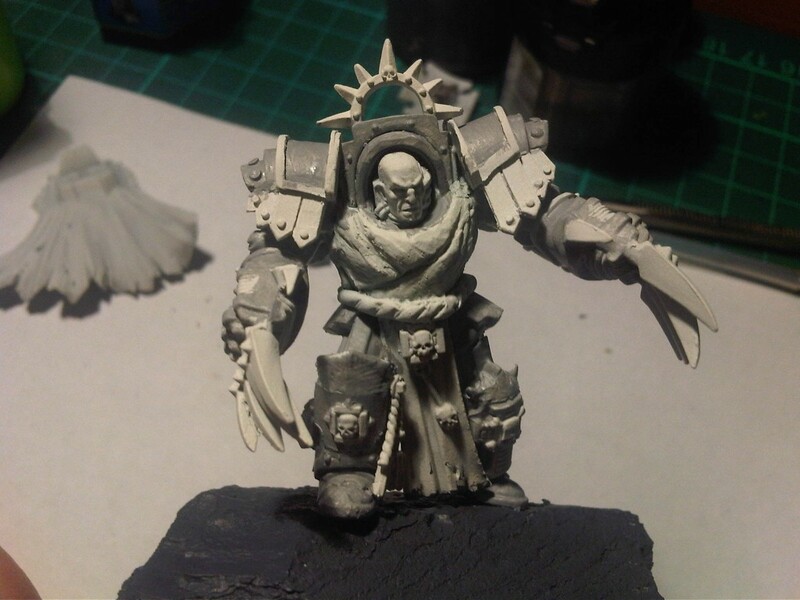 I will be doing a bone style armour on him but I don’t know if I should have the robes reflect a long to the pre-heresy black or have them in a dirty white. I was also thinking red but I have had enough of red with my Blood Angels so I want to do something different. So I’m putting it out to all who can help with this. There is a poll on the left that you can vote on either Black or White so I can get started on it. I’m wanting to do the robes soon so if anyone who has an idea can put it on there or if there is something else that you can think of let me know. Also this is going to be for his Cloak as well. And for a further WIP image have a look below. Great looking Belial. Black robes don’t look too good on bone white armour. Consider a really dark red or purple to be different, but in all honesty there’s nothing wrong with DA green. I’ve had a couple of people say to me why Don’t I do it green… I did think of Red as well but after so many red marines I think I need a break from it on this force heh. I think the Green might be the way to go since the Poll came out even heh. I struggled with his on my Deathwing as well. My first Beial had a green robe, with the red details it looks a bit Christmas ish. I also decided that my Darkangels Vets have whitish robes, and since the inner circle are all buddies they should wear the same robes. 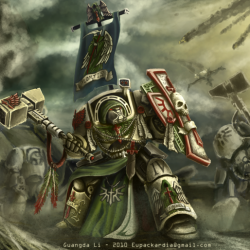 I think the Pre heresy armor you are using can just be considered a sacred relic that is passed down to the Deathwing master, but give him white robes with the green trim to show his Captain’s rank, well, that’s what I did. If I go green on mine I was going to go for a Gold detail on it… I have been keeping away from the Red in the force to the point I’m going with pale blue eye lenses on all the helmets! I’ll have a play around with some colours on him when I get home from work today! I used the Lysander model for both my lighting claw and thunder hammer Belial. I used Marenus Clagar for the sword of secerts (I never use this combo though). I kept the cloaks DA Green as I felt this was more fitting to the character and the chapter. I’d like to see what you did for your one Andrew.